Commonly known in Peru as “kiwicha”, this is a highly nutritious grain, native from South America and since ancient times it has been a fundamental part of the Andean diet. Nowadays it is widely used in a variety of applications all of which take advantage of its extraordinary nutritional qualities. It contains about thirty percent more protein than cereals like rice. Similar protein to wheat germ and oats. 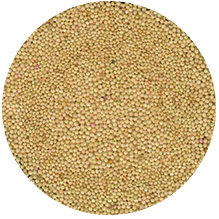 Amaranth grain is particularly high in lysine, an amino acid that is low in other grains. Amaranth can be cooked in liquids and eaten as a porridge or pilaf. It can also be popped like corn. Amaranth flour can make many different foods like: bread, muffins, bagels, pasta, cookies, sauces, pancakes, flatbreads, doughnuts and dumplings. Amaranth pasta is light brown in colour; when it is cooked, the pasta gets the colour of whole-wheat pasta and the regular consistency of it.